Two years ago when I visited Gangjeong village on Jeju Island, South Korea, the one-half mile ancient, solid volcanic slab of a spiritual and cultural rock known as Gureombi was still intact. The marine environment that had made Jeju Island one of the World Heritage Sites was still thriving with sea life. The government of South Korea had moved some equipment to be used for construction of a controversial naval base for Aegis missile destroyers and the US missile defense system. 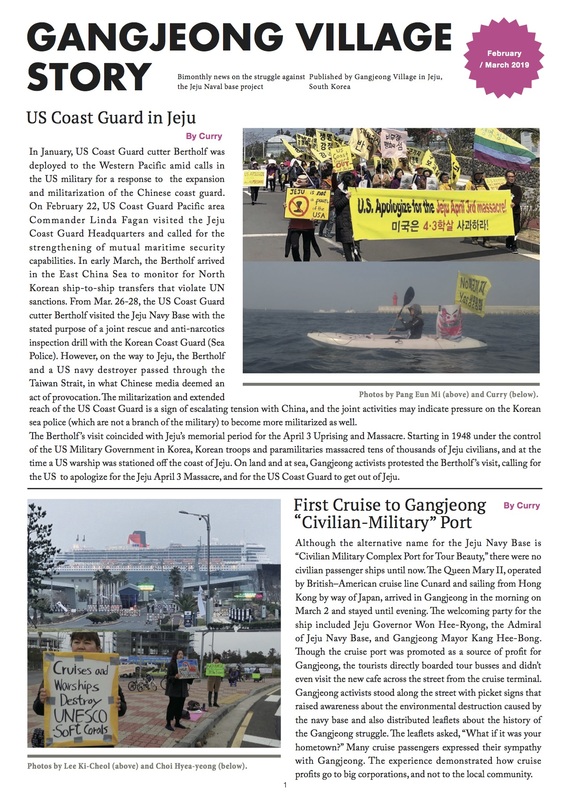 This would be a new military port in a country filled with US and South Korean military installations, but one that would be just a little bit closer to China–a new naval base that would symbolize the US pivot toward Asia and the Pacific. Plane loads of protesters from the mainland of South Korea were flying to Jeju to join villagers to prevent the construction of the naval base. Hundreds of internationals came to add their words of solidarity and to take back the story of a tiny village challenging the might of the governments of the United States and South Korea in their quest for greater militarization of both societies. Two years ago, trucks carrying materials for the new naval base to be built on the rocks were delayed or stopped by protesters. NO BASE supporters climbed on top of high cranes and chained themselves to heavy pieces of equipment to stop construction of the base. I returned this week to Jeju Island in solidarity with the people of the village of Gangjeong who did not want their home turned into a military encampment that would destroy their way of life. Yet, despite seven years of opposition and struggle, the naval base and its harbor have been substantially constructed. Hundreds of thousands of tons of stone have been dumped on corals to make the breakwaters for the harbor. Thousands of massive concrete structures are on the shore. 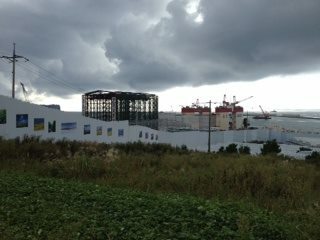 Two giant structures have been erected in the water that produce cassions for the massive breakwater that might protect the military harbor from typhoons. The beautiful rocks of Gureombi have been broken apart and the area filled with concrete. It is an environmental disaster. This week, the edge of a typhoon hit Jeju Island. Many here in the village of Gangjeong were praying for a strong storm that would severely damage the naval base as happened last year that caused over $35 million in damage to the project. Perhaps Mother Nature would intervene to stop the construction when humans were unable to do so. Many activists who opposed the base have gone to jail in the past two years. 5 are currently in jail. Earlier this week, two more were sentenced to lengthy terms in prison- a young 22 year old woman received a sentence of 8 months and a 72 year old was sentenced to 6 months. A filmmaker has been in prison for 253 days and two others for 103 days each. A trial for two more is scheduled for this week. The South Korean government crackdown on protest of the naval base has been strong. Yet every day, a group of activists continue their challenges to the base–some challenges are spiritual and others are physical. On the spiritual side, at 7amthey gather outside the gate of the base and do 100 deep bows, each with a phrase set to music to remind participants of the importance of their mission. At11am, Catholic priests, nuns and lay persons lead a Mass at the gates. Masses have been conducted thee each day for over 740 days. Following the Mass, for the next hour the group blockades the main gate of the naval base stopping trucks filled with concrete and other materials from entering the base and preventing empty trucks from leaving the base. The activists believe a disruption of an hour’s work in the building of the base is useful and important. Tension in Gangjeong village is high. Families have split on support or opposition to the base. 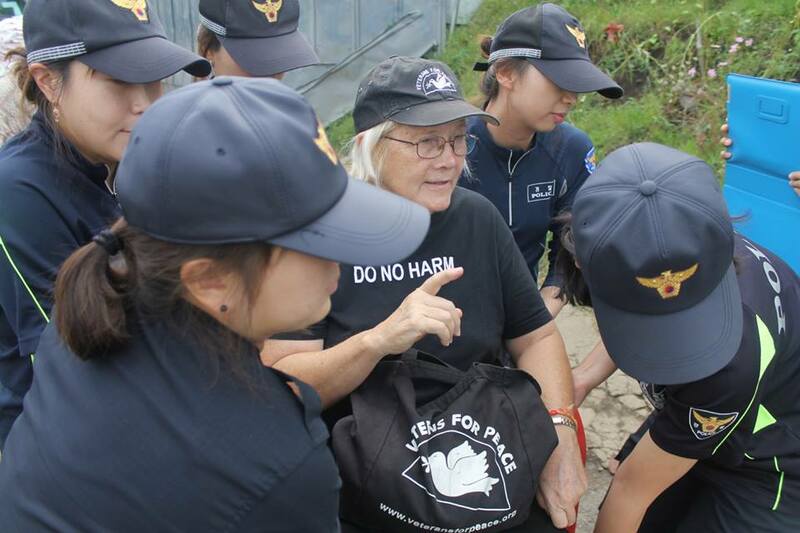 Those in the village and in the provincial government who were paid off by the South Korean Navy not to oppose the base, as two other communities on Jeju Island had done, are in disfavor with many in the village. Having been defeated twice, the Navy decided to have a major campaign to influence the decision makers in the province and Gangjeong village. Decision makers succumbed to the temptations of fully paid trips to Hawaii, Australia and Singapore and other special benefits. Farmers in the village were pressured into selling their lands with the threat that if they didn’t accept the price offered by the Navy, the lands would be taken anyway and much lower compensation given in that case. The lessons of Jeju Island are stark. The US military pivot to Asia and the Pacific will be disastrous for many areas—bases in Okinawa where the US wants to build a runway into the South China Sea over pristine corals, home to the dugong manatee; in Pagan, an island in the Northern Marianas where the US wants to use as a bombing range as it did for decades on the Hawaiian island of Kahoolawe and the Puerto Rican Island of Viequez; and in Guam where the Marines want to have an artillery range in an environmentally protected area. China is upset about US-Philippines military exercises in the South China Sea. The Japanese people are angry that the US is urging the government of Japan to renounce the “No War” article of their constitution so the US will have another financial ally in wars of choice. So far, just as the US pivot to the Middle East twelve years ago destabilized the region, the US pivot to Asia seems to already be having the same dangerous effect. About the Author: Ann Wright served 29 years in the US Army/Army Reserves and retired as a Colonel. She was a US diplomat for 16 years and served in Nicaragua, Grenada, Somalia, Uzbekistan, Kyrgyzstan, Sierra Leone, Micronesia, Afghanistan and Mongolia. She resigned in March, 2003 in opposition to the war on Iraq.